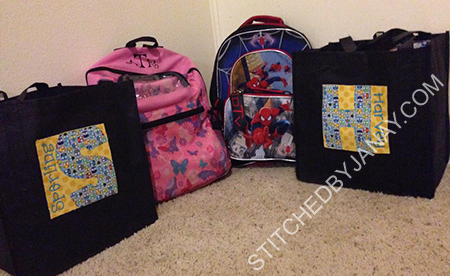 I took this picture Sunday night before going to sleep, all of our bags packed and ready for the first day of school! Annaliese's backpack from last year (errr, two years ago!) is still holding up, so I didn't have any monogramming to do for her. 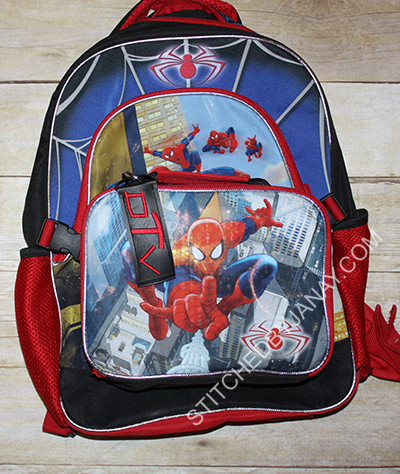 Dashiell picked out this Spider-man backpack and lunchbox set. 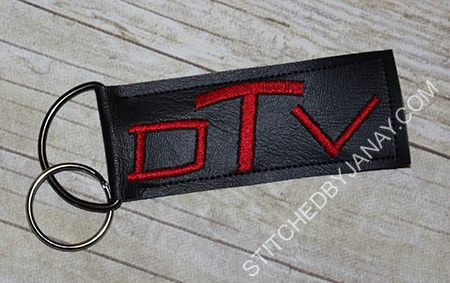 I knew I'd make a keychain type tag for his lunchbox. We debated (at great length) WHERE the monogram should go on his backpack. Front and center didn't work because it would cover up the spider symbol. He nixed every suggestion I made, and I physically couldn't do his suggestions. Boy, he was getting frustrated. Finally he said, "can you put it here?" and pointed to the little plastic sleeve for contact info. I said, "sure!" NO JOKE this took less than five minutes. I hooped tearaway, sprayed adhesive, laid down a piece of black vinyl, stitched the monogram, trimmed the rectangle to proper size and slid it in. 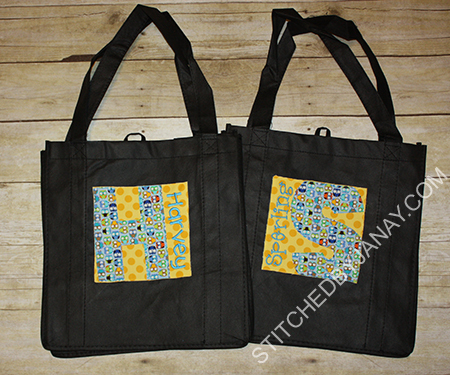 EASIEST bag monogramming job ever! As I have done in the past, I bought a couple Publix shopping bags and monogrammed them to deliver school supplies in. 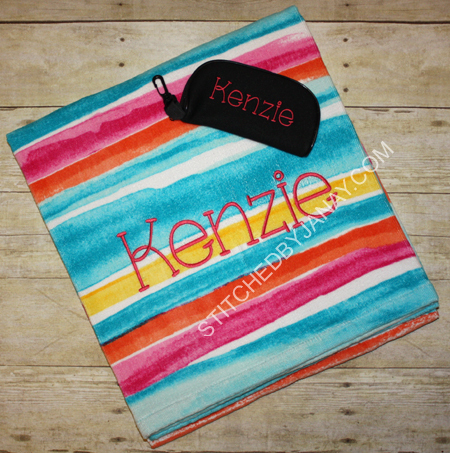 I picked I2S Box Font Applique for the big monograms which made it easy to cover the printed logo. To make things simpler, I skipped the satin stitches and just made the applique raggy (yes, I admit I was doing this at 9pm on Sunday night). 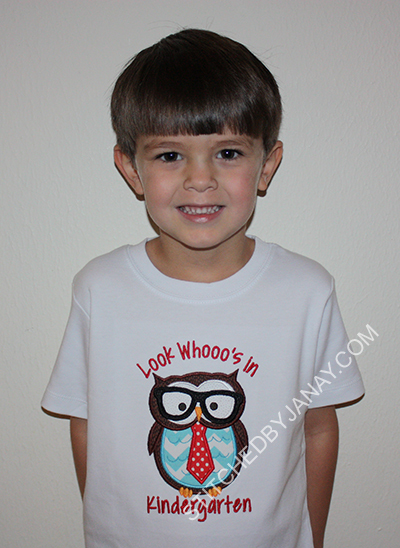 I love this print with the tiny owls! I thought they turned out cute! If you don't own the Box Font alphabet set or number set, they are on sale until Friday morning! You can read all the details on the I2S Facebook page, but in short -- it's because they are my favorite and we are celebrating my 1 year anniversary with I2S :) ENJOY! Well, the day finally arrived... my little man is in kindergarten, and my big girl is in fifth grade! How did this happen?!? 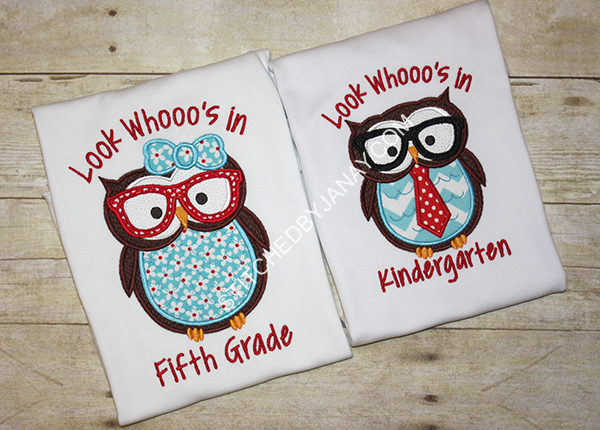 I knew I wanted to use owls, so when I saw Beau Mitchell Boutique's scholar owls at the beginning of summer, I knew they were it! I added the text with I2S's Covered by Your Grace. I didn't really give Annaliese much of a choice on fabric, so thankfully she agreed with my vision, ha! They had a great first day and we anticipate an awesome year! I walked through the design editing process in both Embird Editor and Embrilliance Essentials, not only to help those who already own one of the programs, but to show their different strengths for those who want to purchase software so they could make a more informed decision. I picked these two programs because they are comparable in price AND they are the only two I am familiar with. Ha! 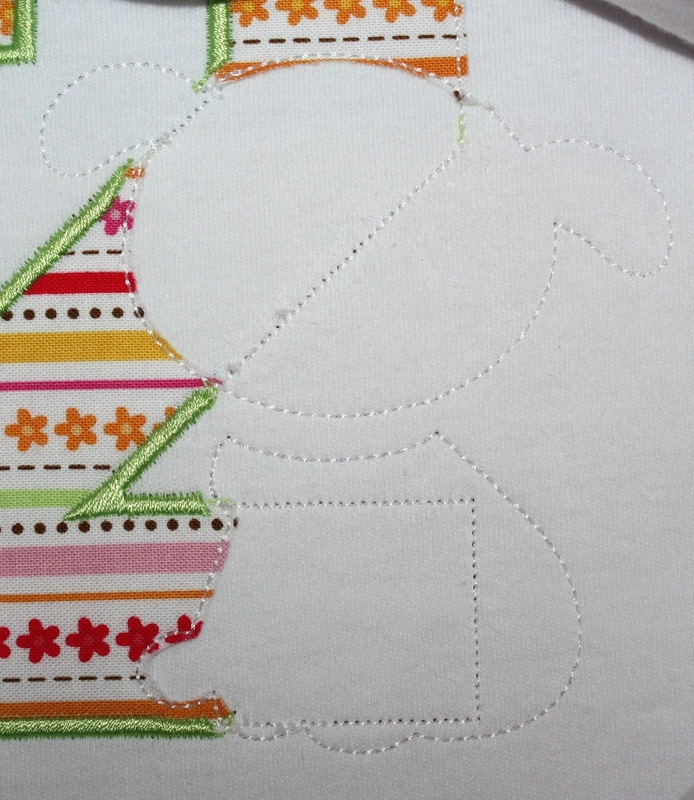 I merged in the Fishing Puppy Applique Design, then deleted the pole, string, and hook. Embird: you can do the same as above, but with a multistep design if you aren't sure which color stops are which, you can right click a color box, select "separate all colors" to break the design into multiple elements. Then the thumbnails will make it clear what colors you should delete. Delete the pole/string/hook. Select all and rejoin those items back together. 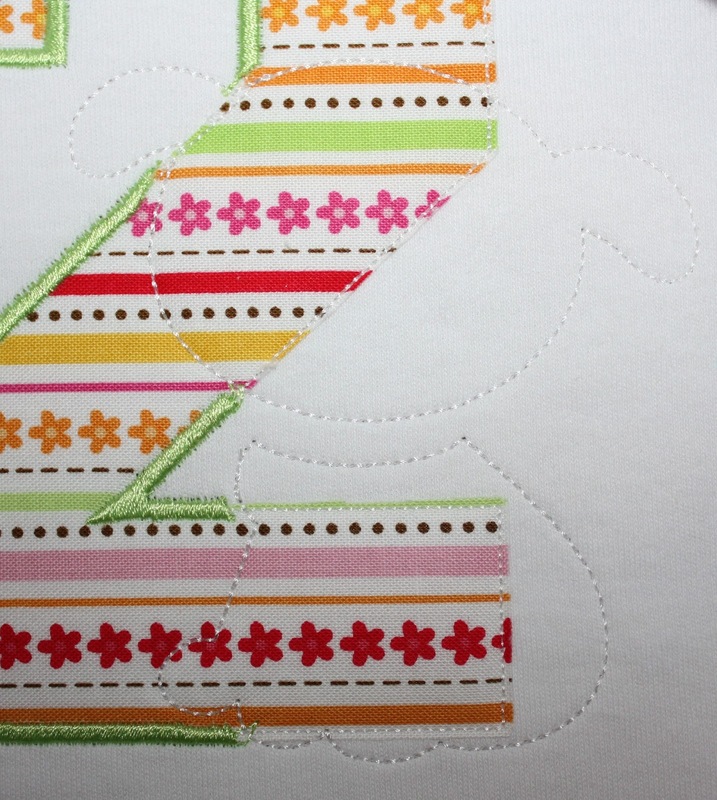 I merged in the Birthday Dino Box Applique to borrow his party hat! Use the same steps as above to remove everything from the design EXCEPT the placement/tackdown/satin/dot for the hat. In Embird only, I adjusted the pull compensation of the puppy so the satin stitch width of the puppy matched the satin stitch width of the hat. 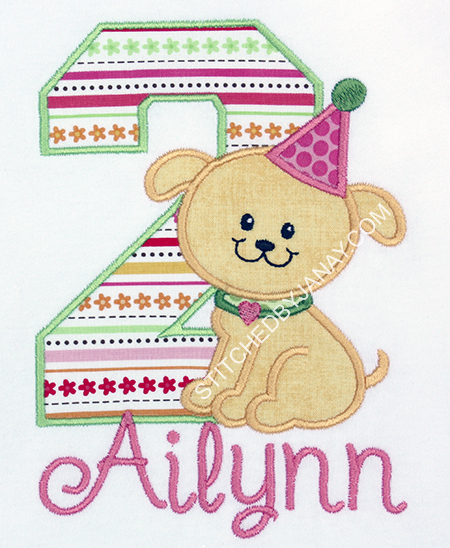 I separated all colors of the puppy, selected just the satin stitch steps and went up to Edit -> Pull Compensation. Entering positive values increases pull compensation (makes it thicker) and negative values makes it thinner. I usually start with something like 0.2 or 0.3, undoing and trying again until it looks just right! Embird: select the love bug design. Then down in the lower right panel, click on one of the pink pink elements. In the workspace the item selected will turn red. I checked to make sure I had the right cheek heart highlighted, then right-click and select "delete all items except this one". BOOM the whole design is gone except for that little heart! Embrilliance: expand the design, highlight the pink step that contains two hearts and copy/paste. Now deleted the entire ladybug design, what you will have left is a new object that is just the hearts. To separate the hearts, you will watch it in stitch simulator, and add a color stop between the hearts. Then you can delete the left heart leaving behind the right heart. I removed the overlapped satin stitches from the designs elements that were being covered by a different applique design. Embird: I started with the dog/hat first. 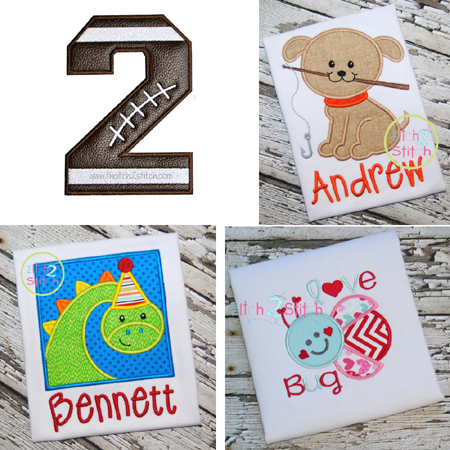 We do NOT want to mess with the placement and tackdown stitches, so on the bottom object click on the satin stitch step and select "hide all colors except this one". Then select the two overlapped applique objects and go to Edit -> Mask. 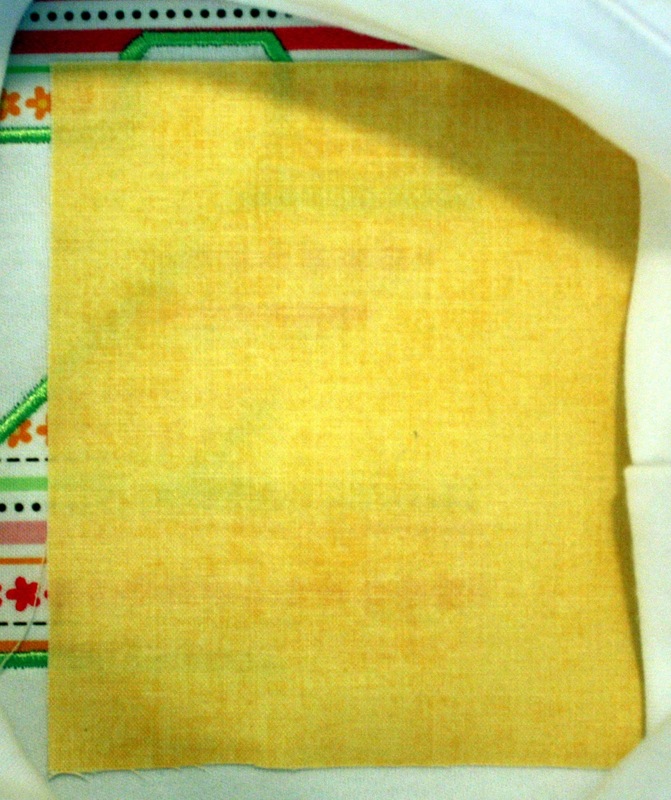 This will remove the satin stitches that are under other stitches, but now we want to remove the stitches that will also be covered by fabric. 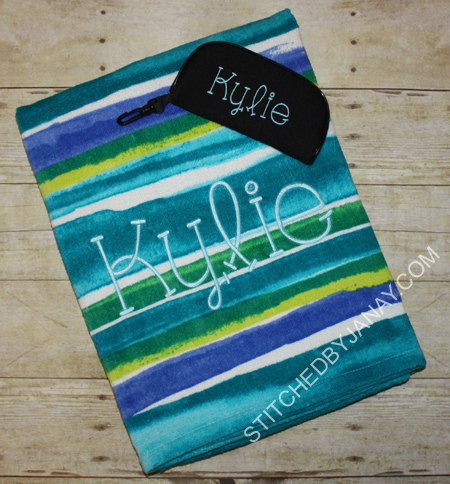 Hide all colors of the top design, and then use the Freehand Select Mode to lasso the unwanted stitches. Click the split button, which will break those stitches out into it's own object, and delete it. Now join everything together and your little dog will have a fun party hat attached! Put the dog where you want on top of the applique 2 and do that process of removing overlapped stitches again. I recolored the design so my preview image in software would match as best as possible the threads I would actually choose at the machine. Embrilliance: click the color box in the lower right panel to select a new color. Last, I added the name using the 1.5" size of Twinkle Star! Embird: merge in the individual letter files. I rearranged the stitch order of the letters as needed by dragging and dropping them in the upper right hand panel. I roughly placed them where I wanted in a straight line, selected them all and used the "align" button to make more exact changes (align bottoms so they are perfectly straight, with the exception of the y that dangles below the baseline -- in that case you select a different letter like the n and the y, and align tops). Select all the letters, join them, then drag into position. Embrilliance: install the BX file that comes in the zip (assuming the digitizer includes it). Click the A button to create a lettering object, type the name, select the font and BOOM there it is! Drag into position. Select everything and be sure it is centered in your hoop and still fits the hoop dimensions. FINALLY Save As a new design name! Now sew! The fabric is going to overlap. Sometimes that is ok sometimes, not. For example, when I laid the yellow fabric on top, the stripes show through! And now I'm ready to continue on. That added extra step at the machine really helps the overall product look like it was digitized that way instead of merged. 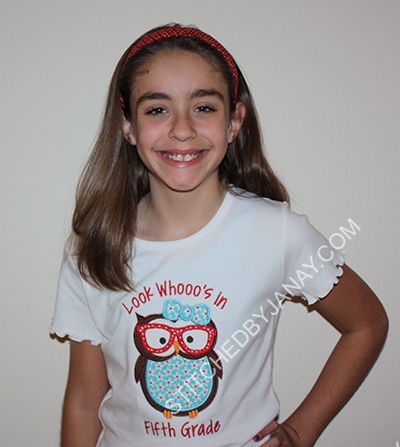 Special thanks to Whimsical Fabric for donating the lovely fabrics I used on this shirt! I *think* that accurately summarizes everything, but it is very hard to type it all out. I hope someday to record some new how-to videos, but that is still a ways off as I transition to a new computer. You can download a pdf of the handout we distributed at AG. Again, it is not word for word, but it does include images of the buttons I clicked for each step of the process. I bought Embird Editor myself 7 years ago because my mother-in-law basically required me to before she gave me my embroidery machine, and I have used it basically every day since. Embrilliance Essentials and AlphaTricks Publisher were complimentary (as an employee of The Itch 2 Stitch) so I could create BX files for our fonts, and I've used it for 6 months. I am not an employee of either Embird or Embrilliance and I did not receiving kickbacks from either for teaching the class. 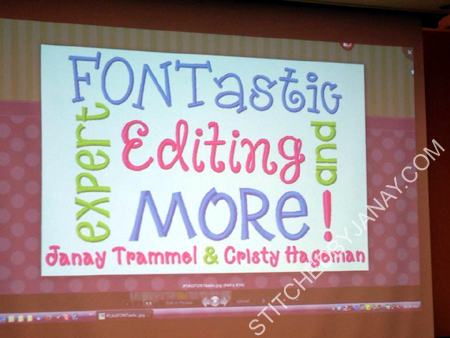 I'm simply a fellow embroiderer showing off what you can do with good editing software. 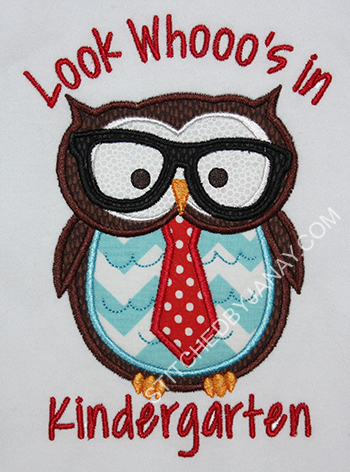 Assume the TOU for the original designs allow you to sell final products, then you could do something like take an apple from one digitizer's designs, borrow some eyes from a second design, pluck some sunglasses off of a third design and add "School is Cool" using a font to make a custom design to stitch on a shirt for your kid or for a customer. 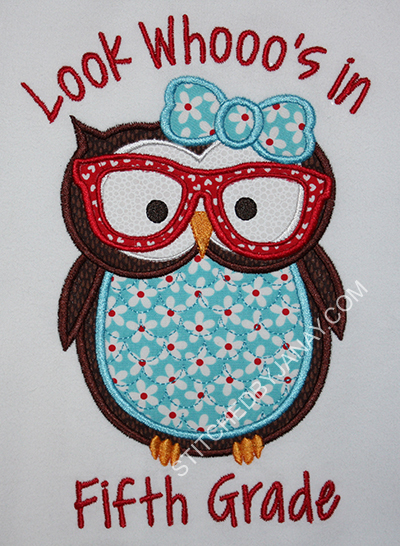 But you CANNOT share or sell that design file to another embroiderer. You did not digitize any part of that merged design, and therefore do not have the rights to distribute the design to anyone else. 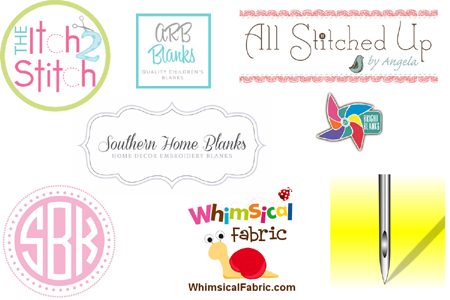 If a friend a couple states away wants to make one too... she would have to buy all the designs and merge it herself. And finally... as soon as you open a design in software to resize, rearrange stitch order, delete elements, add elements, adjust pull compensation... you have basically voided the warranty so to speak. 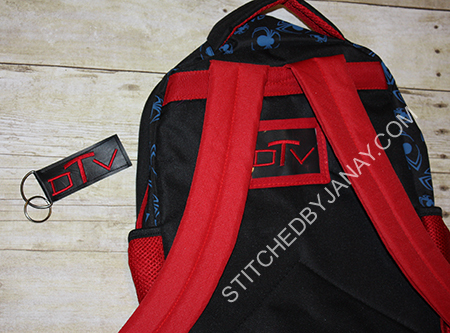 A digitizer cannot guarantee a proper stitchout once you have modified the original file. So edit at your own risk!! I am very confident in Embird's abilities to edit designs, but that's because I have put it to the test and been pleased with the results. Do not take my word for it! Test your first merge jobs on scraps before putting it on a valuable blank. Ok, now, go have fun! 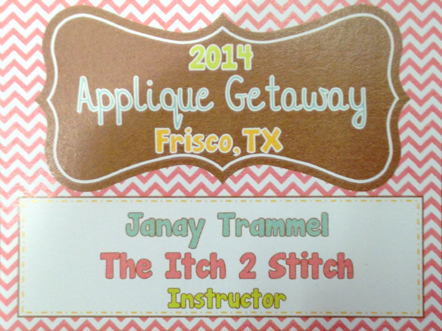 It's hard to believe Applique Getaway 2014 was three weeks ago already! 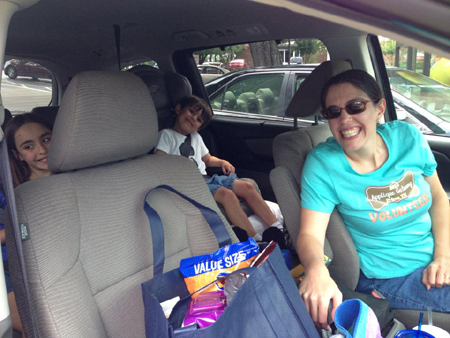 Like last year I combined my attendance at the conference with a long family road trip. We've been home for a week now, I'm basically caught up with my I2S work after vacationing for two weeks (you really should check out all the cuteness Cristy digitized while I was gone), and I'm ready to share my AG experience! Like last year's post, I'm writing this as my personal diary entry about my experience. However, since I taught a class this year, I'm going to talk about the details of what I covered there in a second post. Here we go! My journey to Frisco got off to a rocky start. We were supposed to leave Thursday morning at 5am, but between midnight and 2am my son threw up three times. :( I got ZERO sleep worrying about what in the world I should do... drive by myself and leave sick kiddo at home with daddy, ruining ALL of our plans for the trip? Get in the car anyway not sure if it was a fluke or did we all have a stomach bug? Either way I HAD to go, I was teaching!! I felt nauseous (but it was just nerves). He woke up chipper and ready to go see Grandmama, so I decided to "lay out the fleece" so to speak -- if no one threw up in the morning we would leave at noon. The next morning he seemed ok, didn't even remember taking a bath in the middle of the night. We decided to press on to Frisco and get to MY MOM whom I was desperate to see at that point. We pulled into my aunt and uncle's house, immediately took Dashiell to the walk in clinic five minutes away (no waiting at 5pm on Friday) found out very quickly he had an ear infection, got antibiotics, and then I left both kids in the care of my mom and dashed over to the Embassy Suites. Almost right away I found my dear friend Kaycee and I think I started crying when I hugged her. Whew! I made it! 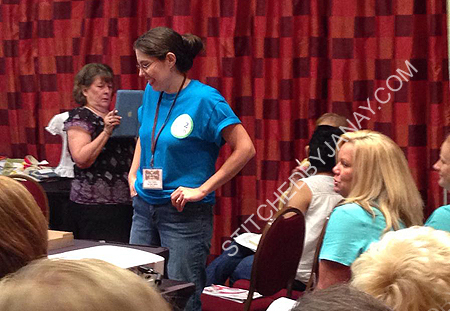 There in the middle of the picture is a pooped Janay who got to meet Lori of Happytown Applique and Johnnie Lee of Little Darlings. 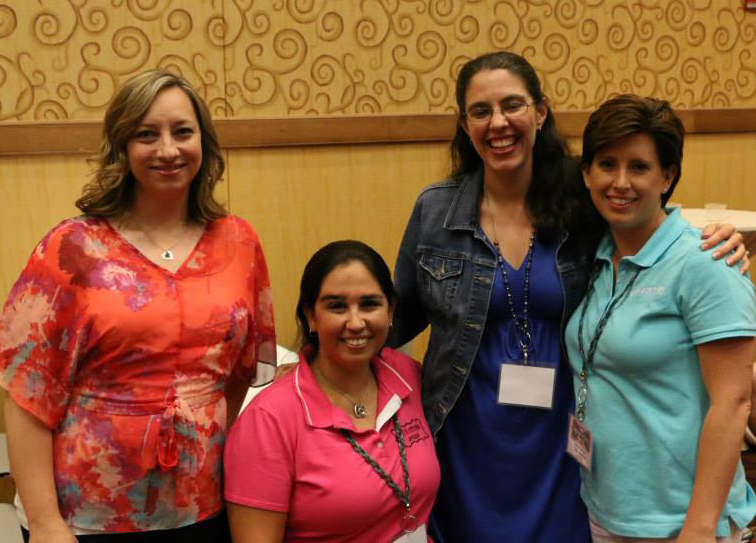 So fun to meet internet friends! :) Unfortunately I was so tired from running on adreneline and caffeine that I didn't get a real picture of us together. 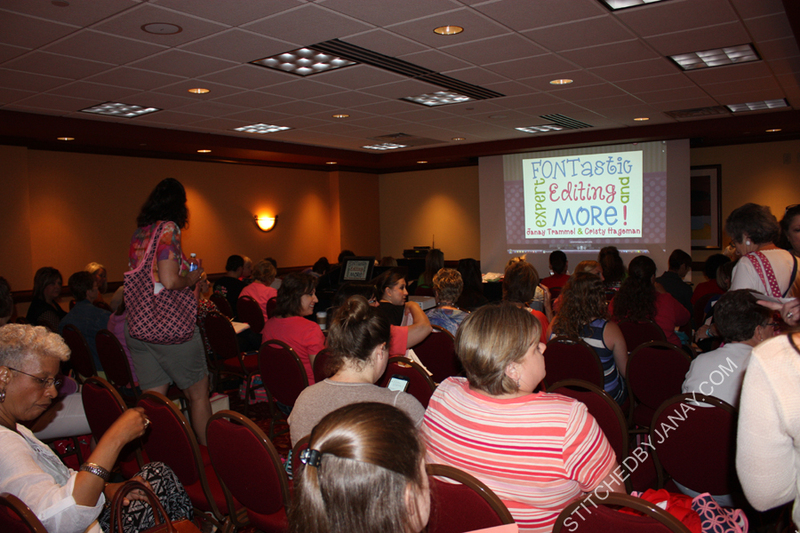 (This pic courtesy of Tobye of Just Sew Pretty). 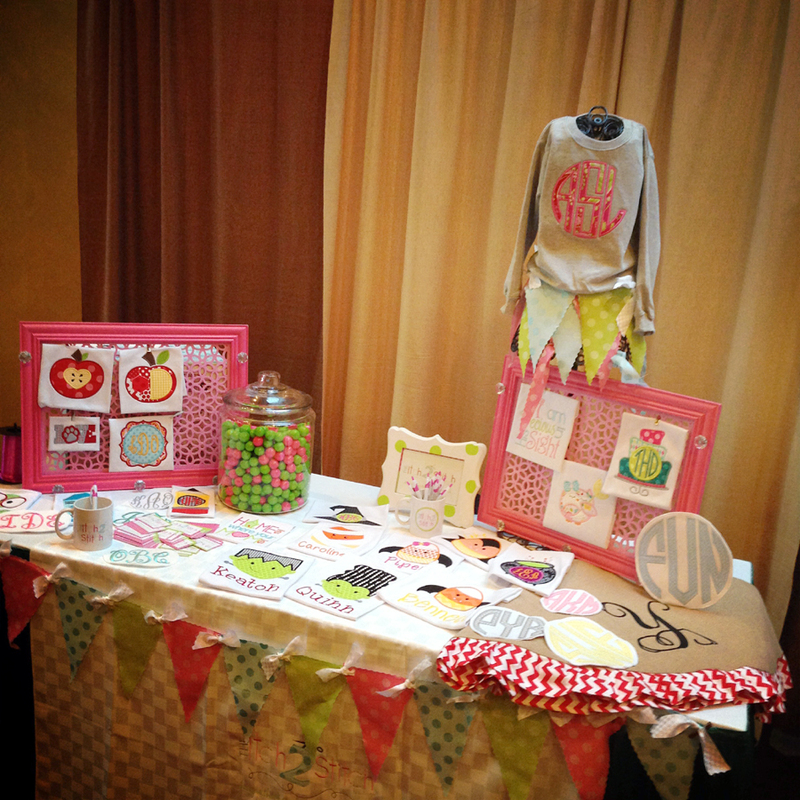 Cristy's booth for The Itch 2 Stitch was already done. Later we did add a few things that I had brought along with me, but I didn't get any pictures of the table after that. Phooey. I found Cristy, met her husband Chad (he sends me my paycheck stub so he's pretty important, ha!) and got settled in my room. Honestly, I don't remember much of what else happened other than going out to dinner with a huge group of volunteers and digitizers! It was yummy and fun even though I was in a daze. 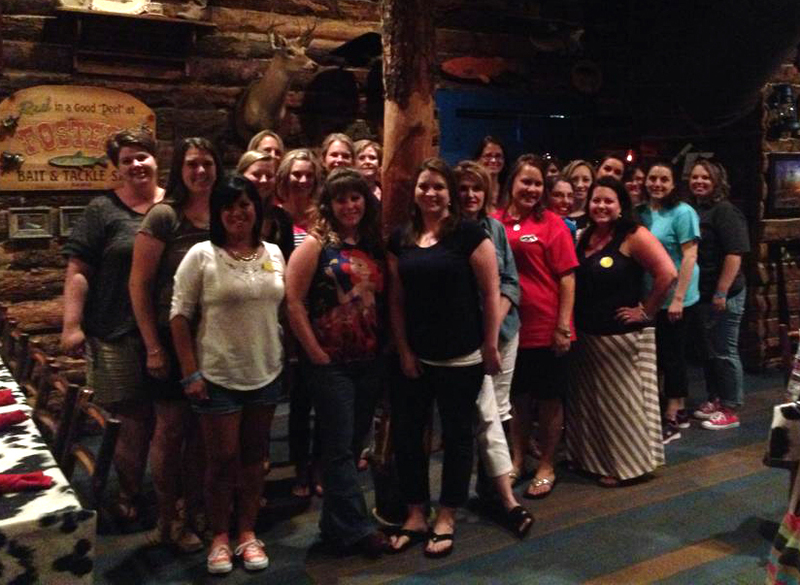 Special thanks to Tracy for sharing this big group picture! I got back to my room, got my final thoughts together for my class the next day, and CRASHED. Saturday morning I was up bright and early to get our room set up for our class: FONTastic! Expert Editing and More! Even though I had been nervous to the point of nausea weeks prior, the morning of I was quite calm. I'm so thankful for the hundreds of friends I had praying for me! See how I'm not freaking out? So many in fact that we didn't have time to call individual names! So we put business cards under 36 seats and surprised the class at the end. That was fun. 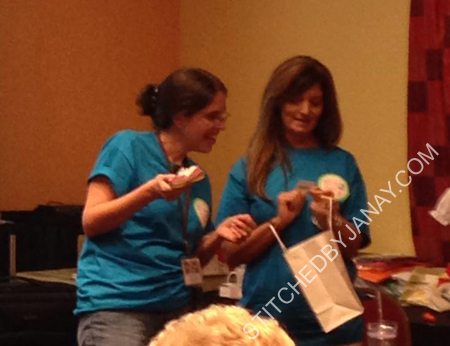 :) We did draw names for the bigger prizes like a gift certificate to I2S and a copy of Embrilliance Essentials. Whew! After that experience I had to decompress. I didn't end up attending any other classes Saturday. The one I was most interested in (taught by Sheila of Savvy Stitches and Marisa of AKA Applique) was right after mine, and by the time I regained some strength and checked the schedule again... it was almost over! The rest of the day I really just wandered around, visiting with people and browsing the vendor booths. So much to look at! 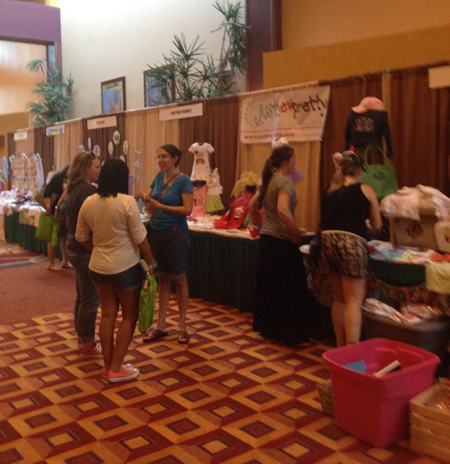 I spent quite a bit of time in All Stitched Up by Angela's booth and left with lots of fun fabric. Kaycee and I also got to chat with Sheila and Marissa! (OH and Shawn... who was gracious to answer all my questions about running Embird on a Mac, which is next up on my to do list). Afterward I went out to dinner with some of my favorite people: Kaycee, Janna, Sara Ann, Cristy and Chad, Rachel and Jose. Nice relaxing evening, no pictures though! 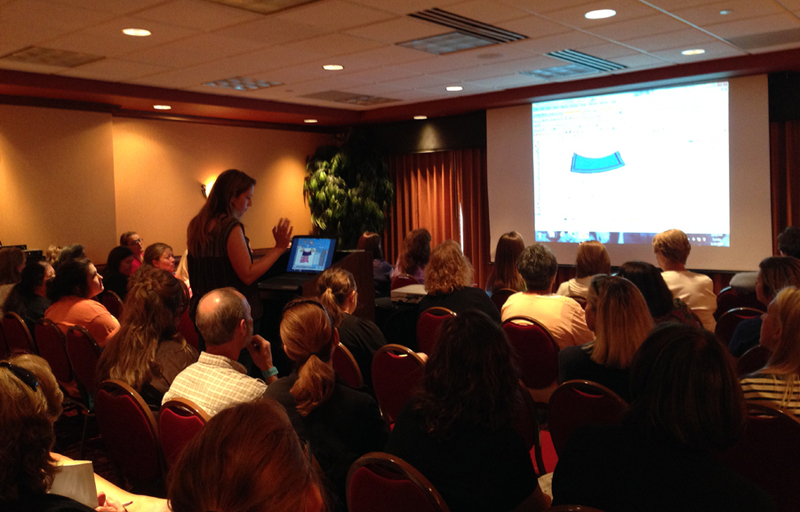 Sunday morning we repeated our class, this time in a smaller room with a smaller crowd (about 100?). 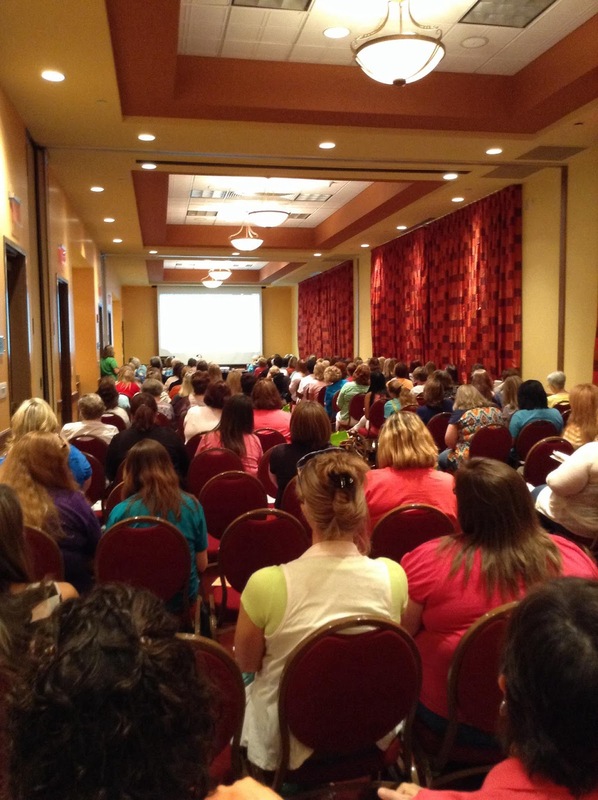 The way the room was set up I had to stand in the middle at the podium. That was different, facing the screen with everyone else instead of being up front and facing them. I kind of liked it better. After that class we did a bit of packing and reorganizing. 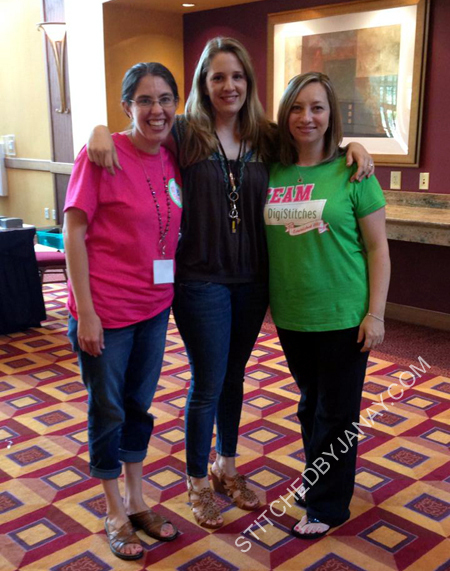 I snagged Lyndsie and Kaycee for a quick picture, I just adore these two women! 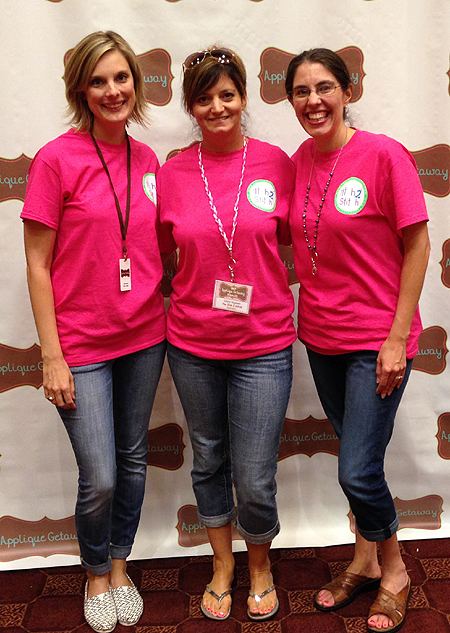 Cristy, Janna and I headed over to the photo booth in our matching tee shirts. 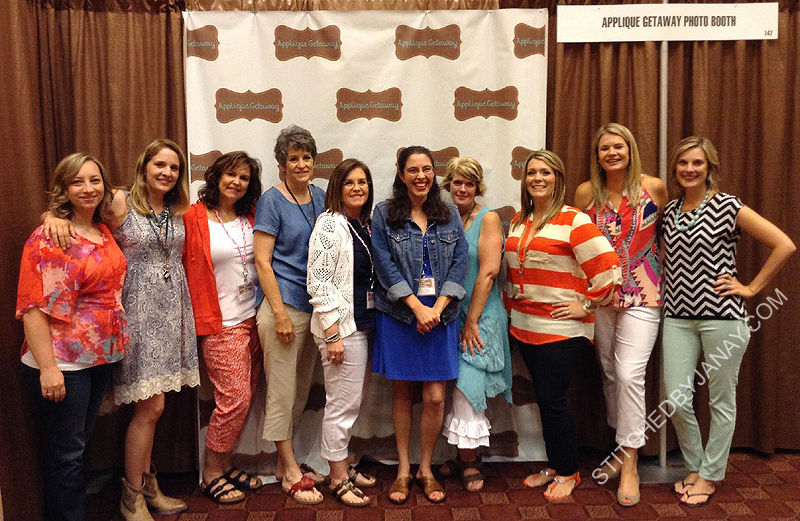 This is The Itch 2 Stitch team! I L-O-V-E working with these girls! Cristy digitizes fabulous designs, Janna brings them to life with her always beautiful combination of fabrics and threads, and then I... well I do a bunch of technical stuff to help get the files online. Ha! I love it! I joined a group of volunteers for lunch (it was nice to meet some new faces) but I had to skedaddle to my volunteer job before the food arrived.... 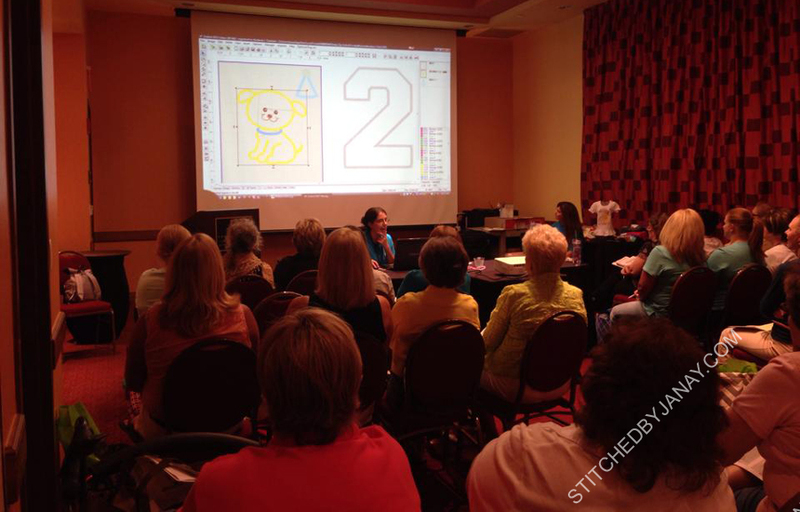 I helped in Lyndsie's class, where she demonstrated how she digitizes an applique design (a cowgirl cutie that will be coming soon to Lynnie Pinnie). 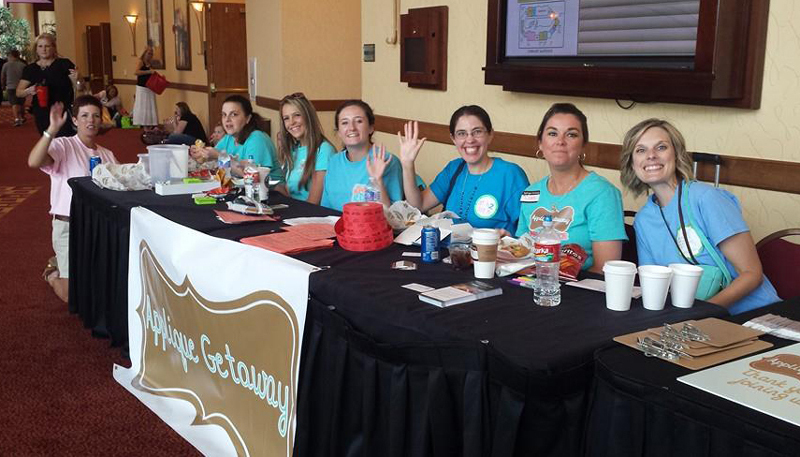 I helped the crew of All Stitched Up by Angela pack up their booth and hugged goodbye to many dear friends. Then the icing on the cake... I got to meet a very special little guy. Lyndsie and I ran up to her room so I could see her son Jacoby. 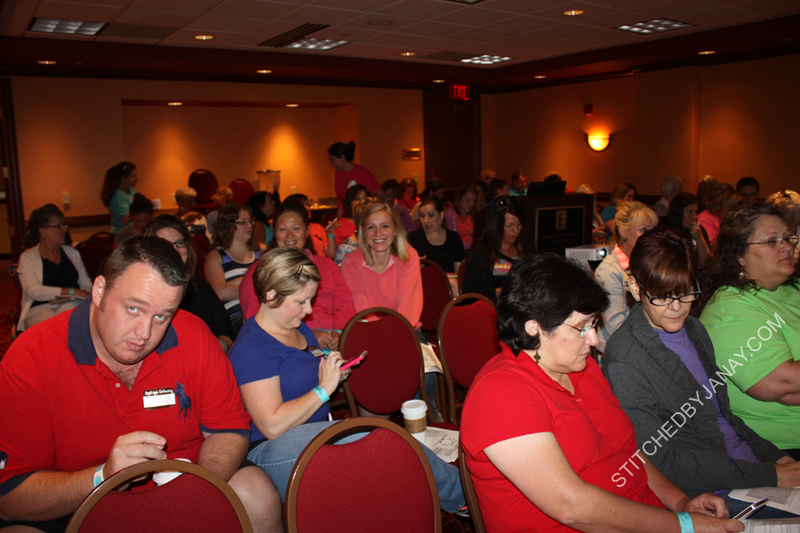 Last year she was VERY pregnant with him at Applique Getaway. 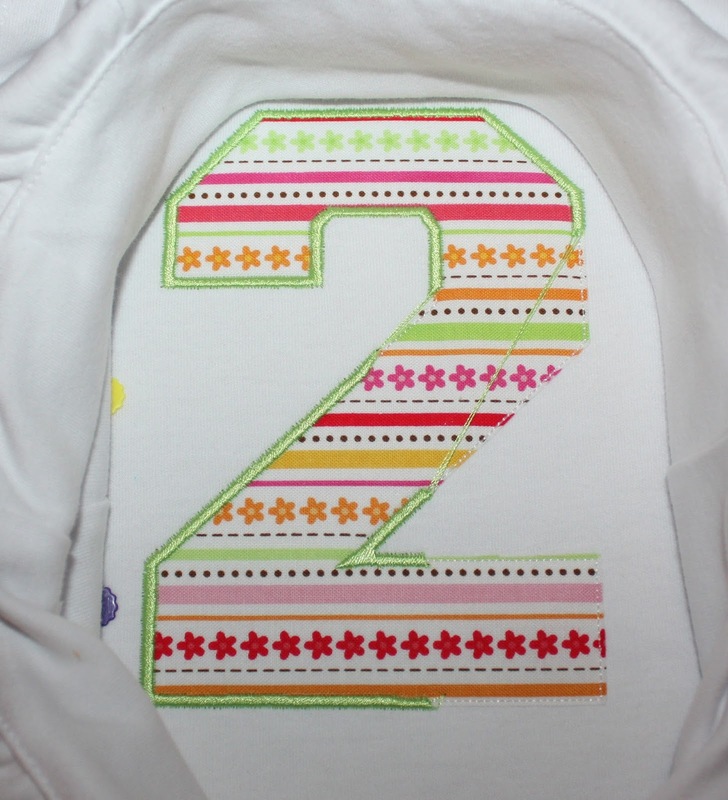 And I gave her a gift of monthly milestone bibs using her Ninja Number designs. 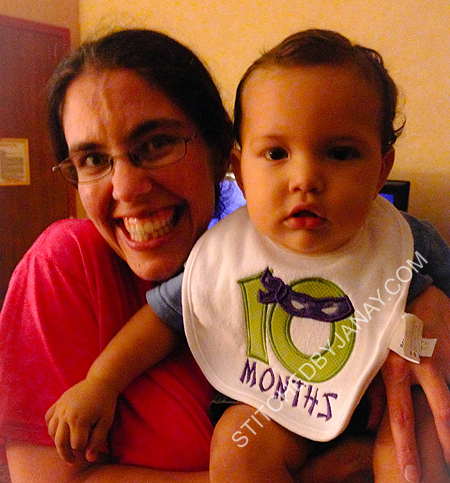 Well out of all the bazillions of things she had to remember, she thought to pack his 10 months bib so we could get a picture in person! Neat, huh?! My niece turned two last week. 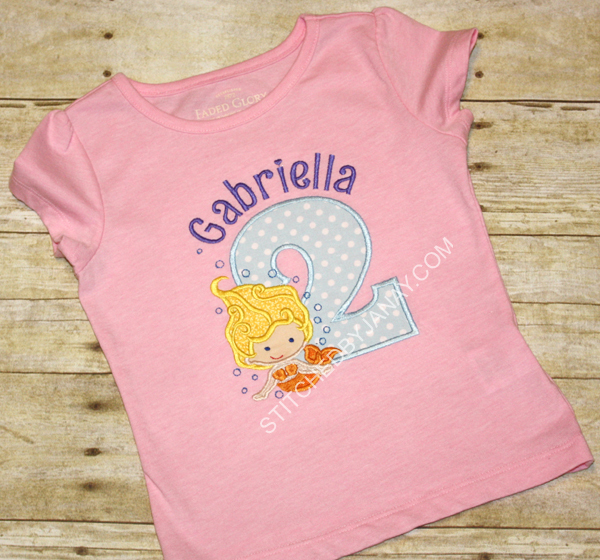 When I asked if there was any special theme for her celebration, her mommy said that Gabriella really liked Bubble Guppies. It's amazing how fast you can get out of the realm of toddler shows because I know nothing about Bubble Guppies, ha! But I had a cute mermaid design in my stash, so I put together this for her to wear. Once completed, when Gabriella saw it she exclaimed "Bubble Buckies!" so apparently it was a win! 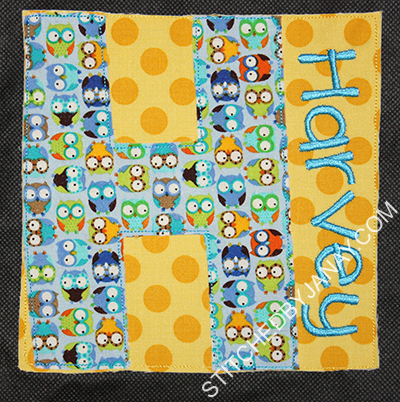 The applique 2 is from Happytown's Swanky Numbers Applique set. 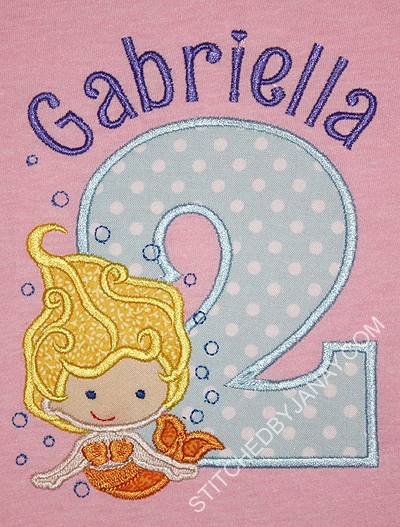 The mermaid cutie was from The Applique Club, and I added her name with DBJJ's Ruby font. 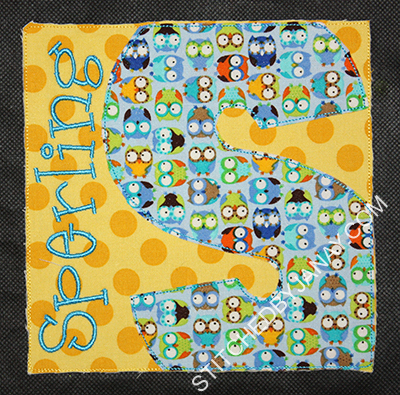 Using Embrilliance Essentials it was so easy to remove hidden stitches from the overlapped appliques and curve the text around the 2. A little friend of mine had a birthday party today. This is the most last minute gift I think I have ever made... 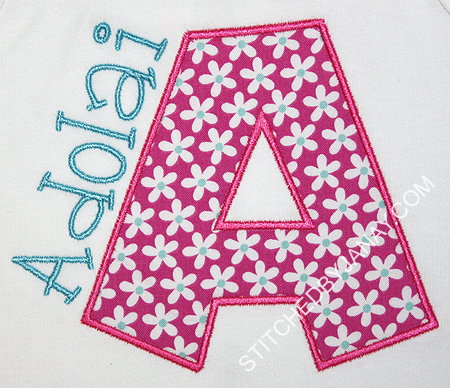 I hit start on my machine at 1:05 and party started at 2:00 :) It had to be sweet and simple, so I picked a one fabric applique (her initial) with her name! 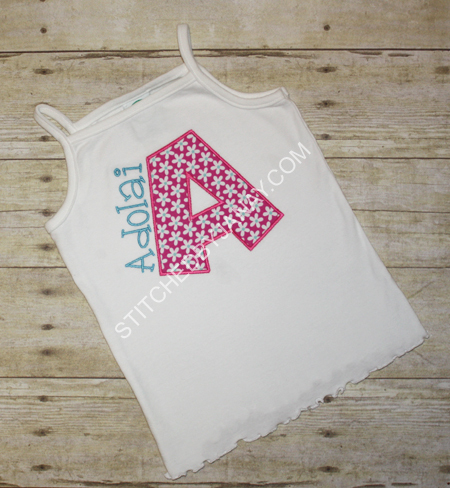 I used I2S Wacky Applique font for the A. 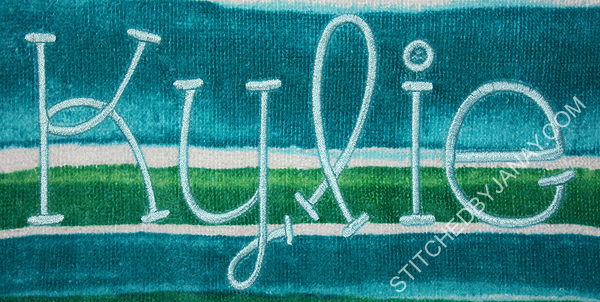 This is a really chunky font that shows off the fabric. I've had this cute fabric sitting in my stash for a while, just waiting to be used for a little girl who LOVES pink! I added her name with Jelly Bean.